Farooq Sheikh was 65 years, 9 months	& 2 days old age. 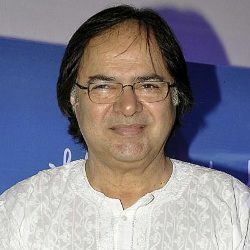 Farooq Sheikh was born on 25-03-1948 in Amroli, Surat in the state of Gujarat, India. He was an Indian Film Actor, Television Actor, Television Presenter, Philanthropist & Theatre Actor who known for his work in Hindi Cinema. Farooq Shaikh was a legendary Indian actor. He was at the peak of his career from the early 1970s to the late 1980s. He has contributed immensely to the Parallel Cinema or the New Indian Cinema. He has worked with noted directors like Muzaffar Ali, Satyajit Ray, Ketan Mehta and Hrishikesh Mukherjee. He completed his schooling at St Mary’s School, Mumbai and college level education from St. Xavier's College, Mumbai. He then studied Law at the Siddharth College of Law. To pursue an acting career, he joined the Film and Television Institute of India, Pune. He started his career as a theatre artist and served theatre for a very long period of time before entering the Bollywood film industry. He made his acting debut in 1973 with the Hindi language film Garam Hawa. The film was a huge hit and Farooq, though was in supporting role was well appreciated by critics. After which, he was offered many meaningful roles in art films. His most famous films of the 1970s include Shatranj Ke Khilari, Noorie, Mere Saath Chal, and Gaman. Noorie was arguably the best romantic role that he played in his entire film career. He continued delivering hits in the 1980s as well. His performance as a supporting actor in Supriya Pathak’s Baazar was well appreciated. He acted in few films during the 1990s and came back after a break in late 2000s and was seen in films like Lahore, Saas Bahu Aur Sensex, Yeh Jawaani Hain Deewani and Youngistaan. The latter was his last film. For his performance in the film Lahore, he won the National Award for Best Supporting Actor in 2010. He has also hosted the famous TV show, Jeena Isi Ka Naam Hai. Farooq Sheikh died on 27-12-2013 in Dubai, United Arab Emirates at the age of 65. He died due to a disease of a heart attack. He was born to a lawyer Mustafa Shaikh & Farida Shaikh. He was married to Rupa Jain and had three daughters with her named Shaaista, Sanaa and Rubina Sheikh. Best Movies Noorie (1979), Chashme Buddoor (1981), Umrao Jaan (1981), Saath Saath(1982), Biwi Ho To Aisi (1988) among Others. He won the National Film Award for Best Supporting Actor in 2010 for Lahore (2009). He was the lead actor of Super Star Salman Khan's debut film Biwi Ho To Aisi (1988). With actress Deepti Naval, He was the famous pair in 1980's of Bollywood. Farooq and his wife Rupa played the theatre during college & film actress Shabana Azmi was the classmate of Rupa. His father was a well-known lawyer in Mumbai & he wants to see Farooq as a famous lawyer. But, Farooq failed in a law degree and start his career in acting. Google honoured him with a doodle on his 70th Birthday i.e. 25-03-2018.